When working with girls, mental health issues and challenges are increasingly common and should be considered in the early stages of program development. As girls enter adolescence, usually between ages 9−13, their confidence declines sharply and they experience higher rates of depression. 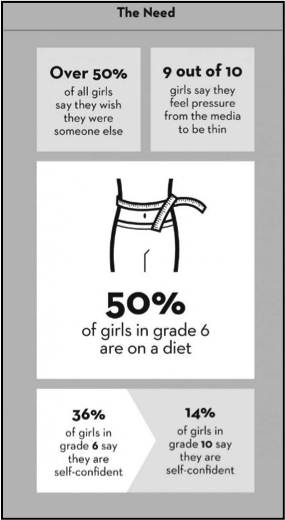 In grade six, 40% of girls say they are self-confident but by grade ten this has plummeted to just 18%. These findings are mirrored for the measurements of girls’ emotional well-being (Freeman et al., 2011). By grade ten, rates of depression in girls have jumped to three times that in boys (Girls Action Foundation, 2011). These are numbers that we cannot ignore and the experience of mental health is very clearly gendered. 1 Regardless of how emotional and mental health indicators were examined, girls reported more negative emotional outcomes, while boys reported more negative indicators for behavioural outcomes. 2 Mental health suffers as adolescents move through the grades, especially for girls, with positive indicators decreasing and negative indicators increasing. 3 About one-fifth of boys and one-third of girls feel depressed or low on a weekly basis or more often. For girls, depression typically stems from “low self-esteem, negative body image, feelings of helplessness and hopelessness and stress” (Boyce et al., 2008). This can affect the way they see themselves, the goals they work toward and how they envision their lives. Hypersexualization of girls is also a factor in low self-esteem. According to the American Psychological Association (2014), the widespread sexualization of girls and women in our society plays a major role in the deterioration of girls’ mental health. Sexualization occurs when a person’s main value is believed to come from their sexual appearance—rather than their intelligence or other qualities—and when they are held to unrealistic standards of physical attractiveness (American Psychological Association, 2007). Research links sexualization with the three most common mental health problems facing girls: low self-esteem, depression and eating disorders (American Psychological Association, 2014). Eating disorders have steadily increased for girls aged 10−19 and are a significantly larger risk for girls. From 2007 to 2013, the rate of females hospitalized for an eating disorder in Canada stabilized—except for 10- to 19-year-olds, whose rate increased by 42% over the last 2 years (Canadian Institute for Health Information, 2014). While depression, low self-esteem, feelings of helplessness and hopelessness, negative body image and stress are common experiences, the range of mental health challenges continues to expand. Anxiety and suicidal ideation are also on the rise. This rise has been attributed to various factors, such as substance abuse, behavioural challenges, or most recently, the result of social media and the particular harmful pressures it causes (The Globe and Mail, 2012).Staff should stay aware of these issues and translate their knowledge to the mentors in the program. Study after study shows that girls are more at risk of facing mental health challenges than boys. The 2011 Health Behaviour in School-Aged Children national survey highlights that, “girls consistently report more negative emotional health outcomes than boys. Mental health suffers as young people move through grades 6 to 10, especially for girls” (Freeman et al., 2011). Furthermore, a Canadian Women’s Health Network study (2008) reveals the way processing mental health issues is very different between girls and boys: “Girls and young women are more likely to ‘act-in’ or internalize mental health issues and mental illnesses, while boys and young men are more likely to ‘act-out’ or externalize mental health issues.” Between grades 6 and 10, girls were more likely than boys to wish they were someone else (Freeman et al., 2011). Gender and mental health also intersect with other key factors, and some groups require more access to support and services since they face greater stigma and discrimination (Mental Health Commission of Canada, 2015). As such, girls group mentoring programs need to consider the prevalent challenges girls face in their lives and reflect on how this will affect relationship building both with the mentor and their peers. 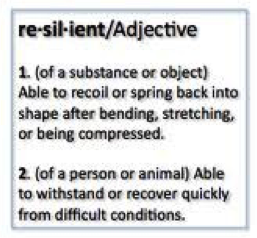 The programs can also help build resilience and protective factors to counter this. Creating positive spaces and incorporating learning around emotional wellness can support girls to deal with the challenges in their lives. If those capacities are not available within their organization, it is the responsibility of programs to have community partnerships or referral sources for girls in need of a more clinical or therapeutic intervention. Based on the statistics, it is more than likely that your girls group mentoring program will include girls who are facing mental health challenges. These mental health challenges can often go unnoticed or can be difficult to identify so it is important to create space where girls can be supported without having to disclose. It’s especially important for youth that front-line workers have this knowledge because community workers, coaches and teachers are often where young people turn to first (Mental Health Commission of Canada, 2015). Mentors should be trained in these areas so they can identify the risk factors and warning signs and be sensitive to girls’ needs. These issues can translate into a range of behaviours and in order to manage the group dynamic, it is important to be knowledgeable of these issues. Consider bringing in an expert for mentor training from the outset. Establish a protocol for mentors who identify a girl in their mentoring group experiencing severe mental health challenges. They should not be expected to intervene with parents, and should instead report to program staff to address the issue. Be mindful that the girls’ issues could stem from their family life. Consult with the girl first to identify how to best help. Sometimes there are larger issues at hand that could be further complicated through intervention. Support a strengths-based group culture of acceptance and support. Create a safe space for girls to share their feelings and feel validated. Reinforce group values from the outset that create this space but also invite girls to come forward with serious issues. Create programming that empowers the girls to take action on issues in their lives and enhances their knowledge and critical-thinking skills. This will help them develop their sense of self and self-efficacy. Incorporate program content that explores emotional wellness and guides girls to engage in practices, thinking and behaviour that promotes emotional wellbeing. See the Boys & Girls Club of London’s resource created for this: My "Me" Journal. Boys & Girls Club of London uses art as the centre of their programming. One participant acknowledged that she had just started taking medication for her diagnosed mental illness. She shared that she was embarrassed by having to take medication. During the group discussions about emotional well-being, she came to understand that there is no shame in seeking to become healthier, both emotionally and physically. Through the safe space of the program and the support of her peers, she overcame her shame and became accepting of herself. This experience also served as a teachable moment for the other girls on self-care and mental health.